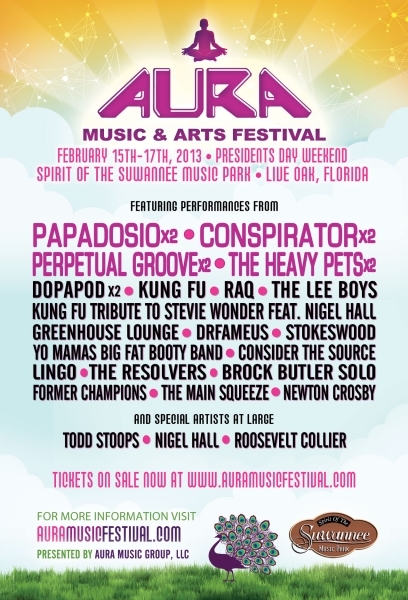 AURA Music Events has unveiled the next phase of the 2013 AURA Music & Arts Festival ( February 15-17) musical line-up which includes 15 stellar acts to compliment the four headliners already announced this summer. In addition to two sets from Papadosio, Conspirator (ft. Marc Brownstein & Aron Magner of the Disco Biscuits), Perpetual Groove and The Heavy Pets, fans can indulge in two performances by Dopapod and Kung Fu including the premier of Kung Fu’s tribute to Stevie Wonder featuring the Royal Family’s Nigel Hall. AURA 4 will also showcase RAQ’s first live show since July 2011, a very rare treat for fans of the Vermont-based jam outfit that’s anchored by Conspirator’s Chris Michetti and Kung Fu’s Todd Stoops. AURA vets returning to the festivities include none other than DrFameus (Allen Aucoin of the Disco Biscuits), Greenhouse Lounge, The Resolvers, Lingo and Former Champions. Taking the AURA stage for the first time is The Lee Boys, Yo Mama’s Big Fat Booty Band, Stokeswood, Consider the Source, Newton Crosby, The Main Squeeze and a special solo set from Perpetual Groove’s Brock Butler. Set in the midst of 800 acres of Spanish moss-draped oak and cypress along the Suwannee River, the Spirit of the Suwannee Music Park is a playground for endless activities such as swimming, canoeing, kayaking, hiking, disc golf and biking. The park also offers guest comforts including a general store, full service restaurant, showers and water stations. In addition to primitive camping, fans can upgrade their AURA experience with RV hook ups, cabin rentals and golf cart rentals.